Oil on canvas, 27 x 37 in. During the Mexican Period in California (1822-1847) life centered on the cattle-raising ranchos, and most “art” was decorative – fancy saddles, clothing, silverwork, etc. Pictorial arts (such as easel paintings) were kept alive by two amateur artists who traveled to the various ranchos to purchase cattle hides, one of the major trade items of the era. Ferdinand Deppe was agent for a German hide trader based in Mexico City. 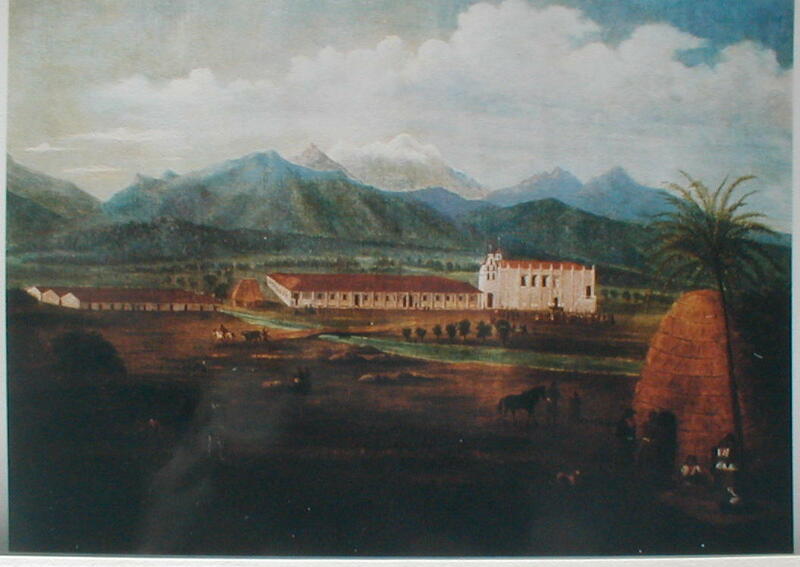 His San Gabriel Mission (dated 1835 according to the California historian Bancroft) is the earliest known oil landscape of Southern California and is an example of the conscientious but somewhat primitive work that amateurs often produced. In the foreground Native Americans (who frequently camped near trading centers such as military forts and missions) live in brush huts, with the mission (located just east of the pueblo of Los Angeles) in the middle ground, and the San Gabriel Mountains as a backdrop. A similar picture (same size and subject but with minor variations) is held by the Santa Barbara Mission archives. Deppe no doubt painted both and about the same time. Lines on the canvas under the paint show that Deppe drew out the mission with a pencil and ruler before applying color. This work was discovered in an antique chest of drawers where it was being used as a drawer liner. Provenance: Poulsen Galleries, Pasadena; reproduced: in color in Nancy Moure, California Art: 450 Years of Painting & Other Media, Los Angeles: Dustin Publications, 1998, p. 18; numerous exhibitions at the Laguna Art Museum and the Orange County Museum of Art.